Hair is the element of our body that makes us more attractive to others, that builds our identity and that can make us look younger with only one different hairstyle. Most of the times we neglect the importance of our hair by submitting it to all sorts of chemicals, dyes or aggressive combing and hairstyling. As in every aspect of life we appreciate something only after we lose it. 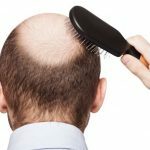 When we start dealing with thinning hair or bald spots from various reasons, not only our confidence goes low, but also our budget. Most hair loss treatments are expensive and sometimes ineffective. Fortunately, there are ways to conceal problematic areas and be yourself again without spending a fortune. Nowadays, hair fibers are the most common and effective way to conceal thinning hair and receding hairlines. They work fast, are easy to apply, cost-effective and can be a short or long-term solution. This article is a review on the Eclipse hair fiber concealer which came second in our 2017 best 6 hair fiber concealers list. 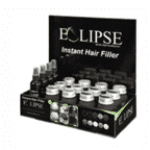 According to its official website, the Eclipse Instant Filler is the number 1 professional only hair builder as it is sold exclusively to beauty salons, barbers and beauty professionals. However, the website, apparently, contains some outdated information because you can also acquire it from Amazon and other various online shops. 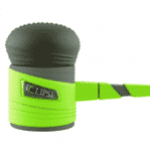 Eclipse uses micro-fiber technology and works instantly for both men and women, of all ages, suffering from hair loss. The colored fibers blend into the existing hair and offer a look of thicker fuller hair in seconds (30 seconds or less). Eclipse Instant Filler contains rayon (or artificial silk). Rayon is made out of tree cellulose throughout an elaborate and long process. Compared to cotton, it takes years before trees reach the maturity at which they can be harvested and their cellulose processed into rayon fibers. Rayon’s amorphous molecules make it thin and lightweight which is why it resembles natural hair so much. The Eclipse hair fibers stay in place for up to a week or until you shampoo and are resistant to wind, rain and perspiration. Eclipse Instant Filler comes in 3 sizes (3 gr, 14 gr and 28 gr) and in 10 different colors (black, dark brown, medium brown, light brown, auburn, cinnamon, dark blonde, light blonde, gray and white) to match any type of hair and any hair color. Eclipse hair fibers are an undetectable instant solution for thin hair, receding hairlines and bald spots. Most Eclipse customers are really pleased with the fact that it works well on a shiny scalp and that is safe to use with any other hair loss treatments. The Eclipse Instant Filler fibers are created using micro-fiber technology and instantly bond with your natural hair offering a full coverage, hiding thinning areas and bald patches. In one shake, thousands of small fibers reach your head, mix with your existing hair and help you regain your youthful confidence in 30 seconds or less. Additional products can accompany the Eclipse Instant Filler for a more precise application or for testing the right color. Eclipse Fiber Locking Spray. The Eclipse Locking Spray is a “fine mist” (according to official website) that creates a lasting bond between the Eclipse hair fibers and your natural hair. The locking spray must be used after applying the fibers and styling your hair as a finishing touch for a long-lasting natural look and an added shine. The spray protects the fibers from falling if you sweat or during rainy and windy weather. It is not sticky and offers a light to medium hold. 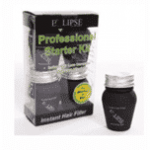 Eclipse Instant Hair Filler Sample Pack. The sample pack includes 4 bottles containing 1 of each most popular colors (black, dark brown, medium brown and light brown) and is meant to show beauty salon clients how easy it is for them to apply it at home. It can be sold as a $3 to $10 service. Eclipse Instant Hair Filler Salon Starter Kit. A complete kit that includes 12 Eclipse Hair Fibers bottles of 14 grams, 4 Eclipse Locking Sprays and 1 high-quality Point of Purchase Display. The Eclipse Instant Filler concealer is an instant solution for bald spots and thinning areas, therefore, it doesn’t require complicated steps to apply it. You can either shake the fibers directly on your head for an overall coverage or attach the patented pump applicator to the Eclipse recipient and gain more control when applying the product. The whole process is very simple. Make sure your hair is dry and apply the fibers. Gently disperse the product by patting or combing it and apply the Eclipse Locking Spray to waterproof and to seal the fibers in place. You will instantly see the results. It is very important that you choose the color that matches your hair for best results and for a natural undetectable look. When you choose the color, match it with your root hair and if that doesn’t work for you, try a darker color. The fibers are meant to stay in place up to a week without falling off on your clothes, skin or pillow. You can use it daily or simply whenever you think you need a retouch. To get it off, you simply have to wash your hair with a regular shampoo. The results of Eclipse Instant Filler are similar to those of the Infinity Hair Building Fibers Concealer. After all, it is a professional product meant for beauty salons. Eclipse has its pros and cons but according to its Amazon reviewers, it is indeed a top concealing product. Most Eclipse customers have been pleased that the hair concealer actually does what it advertises: covers thinning and balding areas effectively. 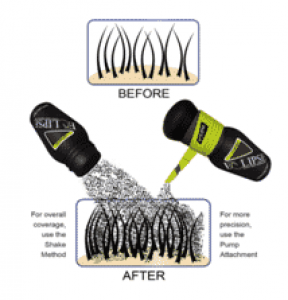 The fibers attach to even the tiniest hair follicles and absorb oils creating a full head of hair and adding volume. The final result is actually a natural look that rebuilds your confidence. Another pro aspect is that the product is easy to use and the colors usually match (except the dark brown option which is more red than brown). The fibers are as fine as real hair, do not fall off most of the time and they stay in for a long period of time. Also, hairdressers recommend Eclipse to their customers and people suffering from hair loss. On the cons side, it appears some customers had a hard time with Eclipse when it comes to the price/quantity ratio. It seems most customers complain about the fact that the recipient contains too little produce for the price they paid. Many say the bottle’s design is inappropriate because they have to open the lid cap to see how much product they actually have left. Some customers observed the fibers clump inestethicaly if you have oily hair or scalp and a few people have had irritations from the main ingredient which is rayon. While most users haven’t had a problem with washing it off, others found that the product wouldn’t come off completely. Customers were pleased to see the product doesn’t make a mess when applying it and were amazed by the precision the pump applicator offers. 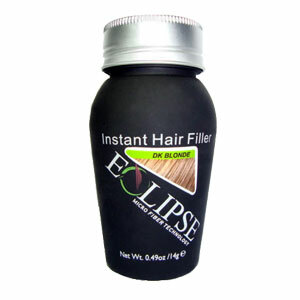 Eclipse Instant Hair Filler is safe to use without concerning about side effects. Many Eclipse customers have used it during or after having chemotherapy and have become loyal customers after trying it. Others have used it during hair loss medical treatments (supplements, special shampoos, hair implants) and have not reported any incidents whatsoever. However, if you are allergic to rayon or suffering from asthma take precautions when using Eclipse. Obviously, an allergic reaction could be dangerous and inhaling the fibers will turn on your asthma symptoms. Overall, there is no danger when using the Eclipse Hair Fibers no matter the age, gender or culture. Eclipse Instant Hair Filler is not only a great hair concealer but also a safe way to regain your confidence. You can apply it easily without making a mess, the hair fibers stay in place most of the time, it offers a natural look and adds volume to your existing hair. 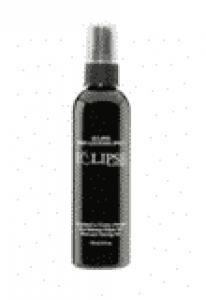 Eclipse offers a full coverage and works best on thinning hair and balding areas (also Alopecia bald spots). It is sold primarily as a professional hair product in beauty salons. The concealer also provides a great absorber for oily hair and scalp although sometimes it may clump on the scalp for that reason. Rayon is the main ingredient used in creating the Eclipse hair fibers through the latest micro-fiber technology. The product is not recommended if you are allergic to this ingredient and take caution if you suffer from Asthma. All in all, Eclipse Instant Hair Filler is definitely a top hair fibers concealer and is worth to give it a try.